The easy way to keep your Fieldtex Excursion Pak First Aid Kit well stocked and ready for the next emergency. CPR/Burns Module (cpr mask, burn gel, gauze, burn dressing). *Pouch not included, supplies delivered in a zip lock bag. 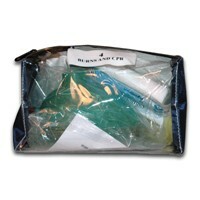 Designed to restock The Excursion Pak Soft First Aid Kit.or the Excursion Pak Hard First Aid Kit.